California eighth graders are ranked 45th in the country in math. That’s according to the most recent scores on the National Assessment of Educational Progress. Meanwhile, the pool of jobs requiring math, science, and engineering experience is growing, especially here in the Bay Area. For people with the right skills, these jobs have become the latest iteration of the American dream -- steady, livable wages, and plenty of demand. 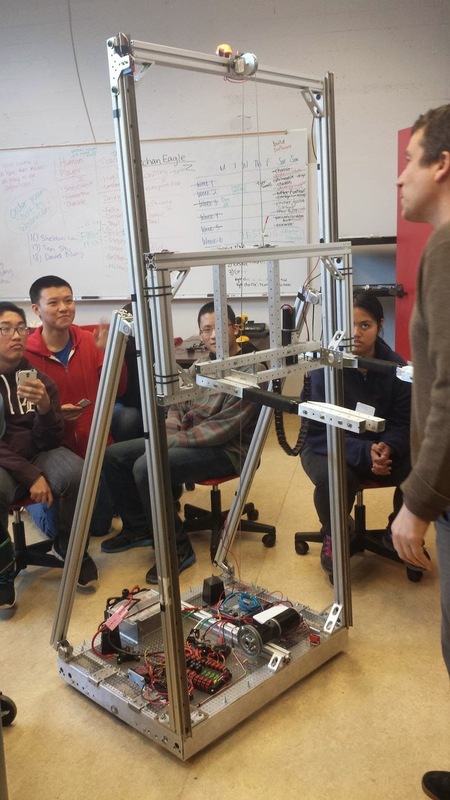 In San Francisco, a few high schools have started offering hands on tech experience to students in after school robotics clubs. George Washington High School in San Francisco’s Richmond District is one of them. They’ve entered a national robot-building competition of 3,000 teams. They have six weeks to build a robot that can lift and stack big plastic bins, for a regional contest in Davis. Around week three, about twenty students are clustered in groups in a small classroom. They’re hunched over computer screens, with bucket-sized bubble teas on their desks. On the floor, there’s something that looks like a car battery got in a fight with a Roomba, scooting back and forth on command. The students have been working on it every day after school - all-day on Saturdays too. So instead the Internet - namely instructional Youtube videos - have become their textbook. They also get help from adult mentors from nearby tech companies, more seasoned high school competitors, and teachers. Math teacher John Hajel is advisor to the club. He also teaches Computer Science at the school, which has gained popularity throughout the years. As the Computer Science program at the school gained momentum, Hajel wanted students to get more hands-on training. So did senior Stephanie Tam. She had friends on Lowell High School’s accomplished Cardinalbotics team. So they started up a club just like it. Interest wasn’t a problem, but money was. The parts for the robot cost thousands of dollars alone. A neighborhood organization helped the club get 20,000 dollars from Facebook. Tech money in the SFUSD is not a new thing. This past year alone, Salesforce.Com donated five million dollars to the district. Hajel says he’s grateful for the resources, but the tech giants make some educators uneasy.